Peaches. Peach Pie. Waffles. Yep. They go together. 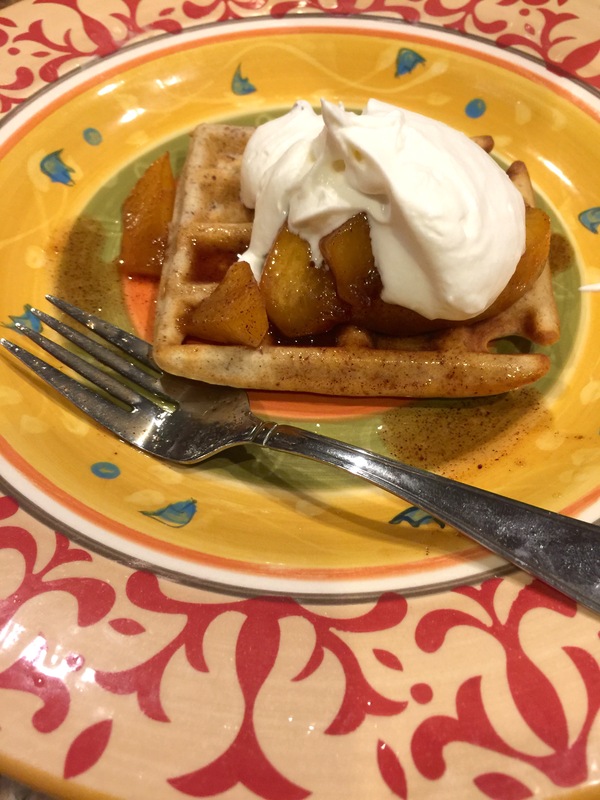 So it’s National Peach Pie/Waffle Day as I write this post and I thought why not?! 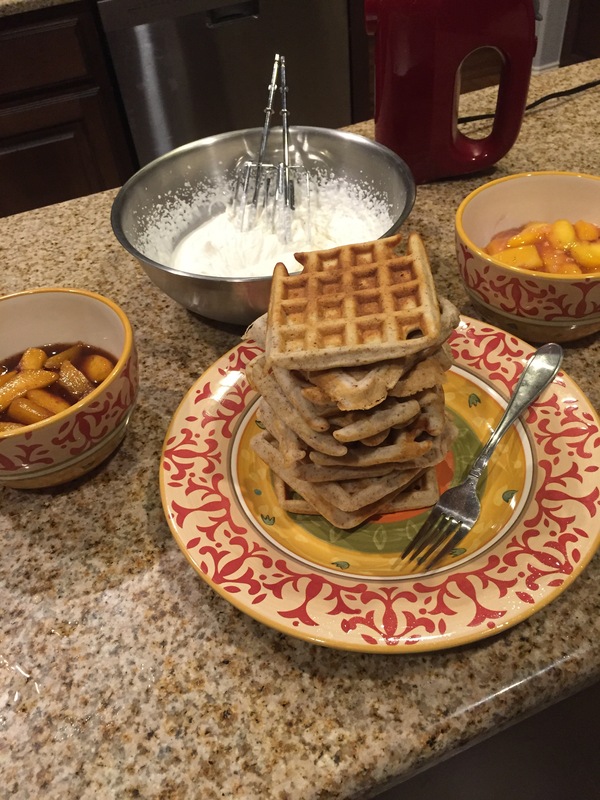 I looooooooove waffles and peaches and well anything sweet and full of carbs to be perfectly honest. 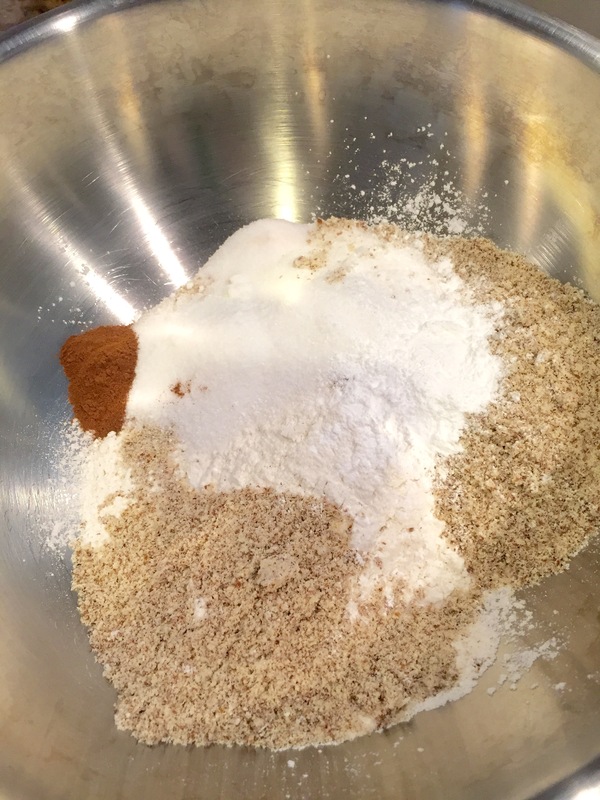 In a large bowl, combine flour, almond meal, sugar baking powder, cinnamon and salt. Set aside. 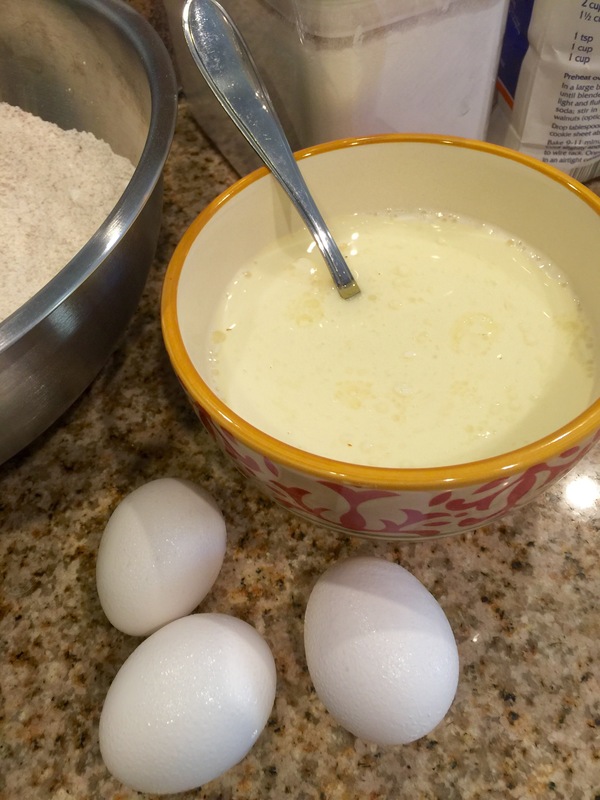 Gently fold the milk mixture into the flour mixture and stir until smooth. It is okay if the batter has a few lumps. Do not over mix. Serve the waffle immediately with butter and maple syrup, or your choice of toppings. Waffles are best enjoyed the same day. For the peaches…… I was really feeling the idea of a bourbon peach topping but was afraid it might be too many flavors so I made a plain peach topping and one with rum. Almost every recipe I read said to boil your peaches for like a minute and then put them in ice water to loosen the skin for easy peeling. 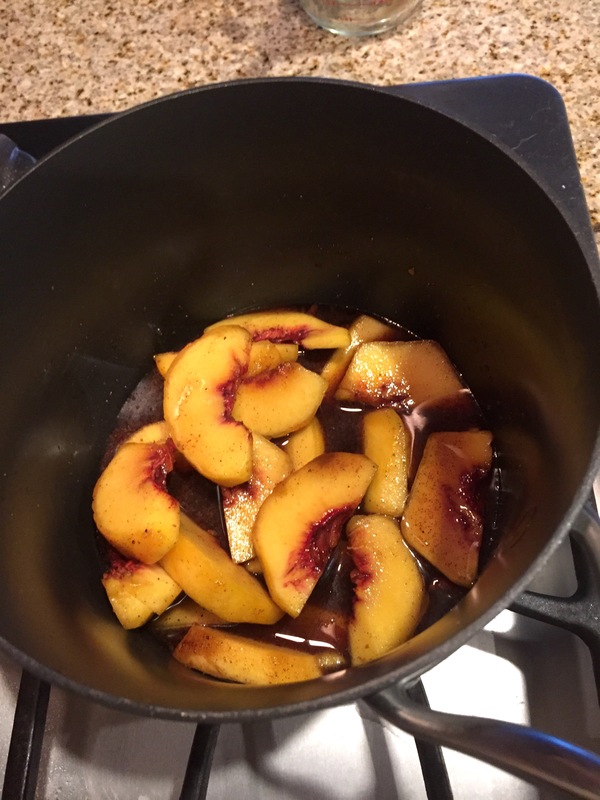 I found a yummy peach topping recipe on Real Mom Kitchen. In a large sauce pan, combine the water, sugars, and cornstarch. Bring mixture to a boil while stirring and boil until the mixture thickens. This should take about 30 seconds to 1 minute. Remove from the heat. Whisk in the nutmeg, almond extract, and food coloring (if desired). Fold in diced peaches until peaches are well coated and combined with the mixture. 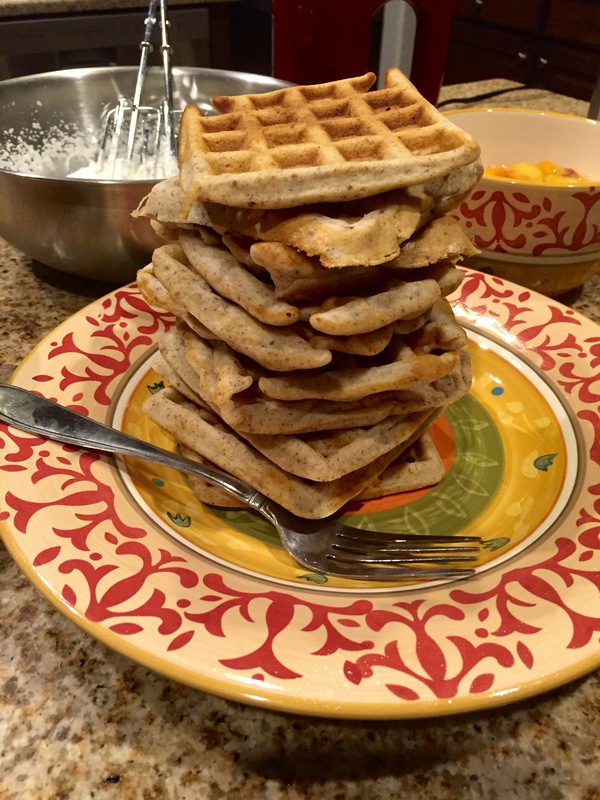 Serve warm over waffles, pancakes, etc. For the peaches with a little extra kick I found this one on Food Bully. Peel and slice peaches. Add sugar, cinnamon, nutmeg and rum. Cook off the peaches until the liquid resembles a thick syrup. Ready to serve. Now for the cream!!! I just did a basic whipped cream. Place mixer bowl and whisk in fridge for about 30 minutes or the freezer for like 10 minutes to chill. Side note – if you want your whipped cream a little thicker and sweeter try putting in a teaspoon to a tablespoon of confectioners’ sugar. I hope y’all enjoy this Frankenstein creation of fluffy goodness. Please let me know what you think! I would love to have some feedback and of course don’t forget to subscribe and follow me on socila media for more great ideas!